“With the demise of the Seljuq Sultanate of Rum (c 1300), Turkish Anatolia was divided into a patchwork of independent states, the so-called Ghazi emirates. 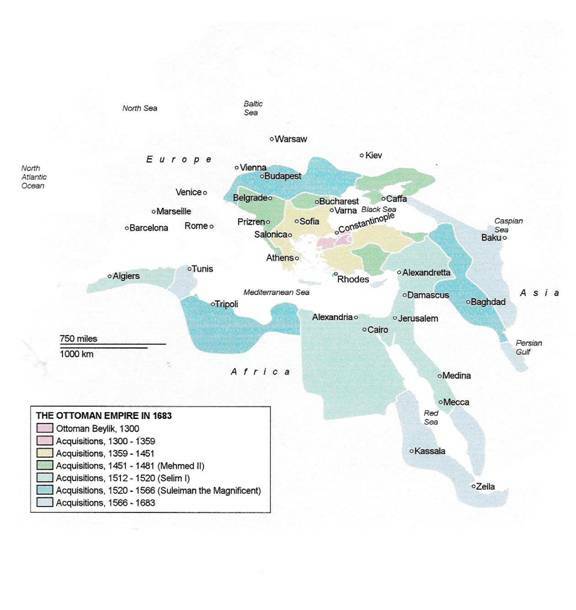 By 1300 a weakened Byzantine Empire had lost most of the Anatolian provinces to ten Ghazi principalities. One of the Ghazi emirates was led by Osman I (from which the name Ottoman is derived), son of Ertugrul, around Eskisehir in western Anatolia. Osman I extended the frontiers of Ottoman settlement toward the edge of the Byzantine Empire. He moved the Ottoman capital to Bursa, and shaped the early political development of the nation. Given the nickname “Kara” (which means “black” in modern Turkish, but alternatively means “big/great” or “strong” in old Turkish) for his courage…Mehmed II made the city [Constantinople] the new capital of the Ottoman Empire, and he assumed the title of Kayser-I Rum (Caesar Romanus = Roman Emperor). The Russian Tsars also claimed to be the successors to the eastern imperial title. To consolidate his claim, Mehmed II wanted to gain control over the Western capital, Rome, and Ottoman forces occupied parts of the Italian peninsula. They started with the invasion of Otranto and Apulia on July 28, 1480. After Mehmed II’s death on May 3, 1481, the campaign in Italy was cancelled and Ottoman forces retreated. The Ottoman conquest of Constantinople in 1453 by Mehmed II cemented the status of Empire as the preeminent power in southeastern Europe and the eastern Mediterranean…During this period in the 15th and 16th centuries, the Ottoman Empire entered a long period of conquest and expansion, extending its borders deep into Europe and North Africa. Conquests on land were driven by the discipline and innovation of the Ottoman military; and on the sea, the Ottoman navy aided this expansion significantly. The navy also contested and protected key seagoing trade routes, in competition with the Italian city states in the Black Sea, Aegean and Mediterranean seas and the Portuguese in the Red Sea and Indian Ocean. The state also flourished economically thanks to its control of the major overland trade routes between Europe and Asia. This lock-hold on trade between western Europe and Asia is often cited as a primary motivational reason for Isabella I of Castile to fund Christopher Columbus’s westward journey to find a sailing route to Asia…Another group of historians led by the Turkish historian M. Fuat Koprulu championed the “gazi thesis” that saw the Ottoman state as a continuation of the nomadic Turkic tribes on a much larger scale, and argued that the most important influences on the Ottoman state came from Persia…” That is a very interesting observation, since we have seen the Edomites, parts of their race, had migrated early on into Persia, then northeastward as far as Mongolia and Turkestan, and then back to the Caspian Sea, and finally back into Asia Minor as the Seljuqs, and now as the Ottomans were conquering and moving back into all of the eastern Mediterranean sea region and as we’ll see, parts of Western Europe. “…The Empire prospered under the rule of a line of committed and effective Sultans, Sultan Selim I (1512-1520) dramatically expanded the Empire’s eastern and southern frontiers by defeating the Shah Ismail of Safavid Persia, in the Battle of Chaldiran. Selim I established Ottoman rule in Egypt and created a naval presence on the Red Sea. Selim’s successor, Suleiman the Magnificent (1520-1566), further expanded upon Selim’s conquests. After capturing Belgrade in 1521, Suleiman conquered the southern and central parts of the Kingdom of Hungary. (The western, northern and northeastern parts remained independent. )…He then laid siege to Vienna in 1529, but failed to take the city after the onset of winter forced his retreat. In 1532, he made another attack on Vienna with an army thought to be over 250,000 strong, but was repulsed in the Siege of Guns, 97 kilometers (60 mi) south of the city at the fortress of Guns…Anyway, Suleiman withdrew at the arrival of the August rains and did not continue towards Vienna as previously planned, but homeward…Under Salim and Suleiman, the Empire became a dominant naval force, controlling much of the Mediterranean Sea. The exploits of the Ottoman admiral Barbarossa Hayreddin Pasha, who commanded the Ottoman Navy during Suleiman’s reign, led to a number of military victories over Christian navies. Among these were the conquest of Tunis and Algeria from Spain; the evacuation of Muslims and Jews from Spain to the safety of Ottoman lands (particularly Salonica, Cyprus, and Constantinople) during the Spanish Inquisition; and the capture of Nice from the Holy Roman Empire in 1543…As the 16th century progressed, Ottoman naval superiority was challenged by the growing sea powers of western Europe, particularly Portugal, in the Persian Gulf, Indian Ocean and the Spice lands. With the Ottomans blockading sea-lanes to the East and South, the European powers were driven to find another way to the ancient silk and spice routes, now under Ottoman control. On land, the Empire was preoccupied by military campaigns in Austria and Persia, two widely separated theatres of war. The strain of these conflicts on the Empire’s resources, and the logistics of maintaining lines of supply and communication across such vast distances, ultimately rendered its sea efforts unsustainable and unsuccessful. The overriding military need for defense on the western and eastern frontiers of the Empire eventually made effective long-term engagement on a global scale impossible…In southern Europe, a coalition of Catholic powers, led by Phillip II of Spain, formed an alliance to challenge Ottoman naval strength in the Mediterranean Sea. Their victory over the Ottoman fleet at the Battle of Lepanto (1571) was a startling blow to the image of Ottoman invincibility…[but] within six months of the defeat a new Ottoman fleet of some 250 sail including eight modern galleasses had been built, with the harbours of Constantinople turning out a new ship every day at the height of construction. In discussions with a Venetian minister, the Turkish Grand Vizier commented: “In capturing Cyprus from you, we have cut off one of your arms; in defeating our fleet you have merely shaved off our beard.” The Ottoman recovery persuaded Venice to sign a peace treaty in 1573, and the Ottomans were able to expand and consolidate their position in North Africa. However, what could not be replaced were the experienced naval officers and sailors. The battle of Lepanto was far more crucial as sapping experienced manpower than loss of ships…On September 15, 1656 the octogenarian Koprulu Mehmed Pasha accepted the seals of office having received guarantees from the Valide Turhan Hatice of unprecedented authority and freedom from interference. Å fierce conservative disciplinarian, he successfully reasserted the central authority and the empire’s military impetus. This continued under his son and successor Kopulu Fazil Ahmend (Grand Vizier 1661-1676). The Koprulu Vizierate saw renewed military success with authority restored in Transylvania, the conquest of Crete completed in 1669 and expansion into Polish southern Ukraine, with the strongholds of Khotyn and Kamianets-Podilskyi and the territory of Podolia ceding to Ottoman control in 1676. This period of renewed assertiveness came to a crashing end when Grand Vizier Kara Mustafa Pasha in May 1683 led a huge army to attempt a second Ottoman siege of Vienna. The final assault being fatally delayed, the Ottoman forces were swept away by allied Habsburg, German and Polish forces spearheaded by the Polish king Jan Sobieski at the Battle of Vienna. The alliance of the Holy League pressed home the advantage of the defeat at Vienna and 15 years of see-sawing warfare, culminated in the epochal Treaty of Karlowitz (January 26, 1699), which ended the Great Turkish War and for the first time saw the Ottoman Empire surrender control of significant European territories (many permanently), including Ottoman Hungary. The Empire had reached the end of its ability to effectively conduct an assertive, expansionist policy against its European rivals and it was to be forced from this point to adopt an essentially defensive strategy within this theatre. Only two Sultans in this period personally exercised strong political and military control of the Empire: the vigorous Murad IV (1612-1640) recaptured Yerevan (1635) and Baghdad (1639) from the Safavids and reasserted central authority, albeit during a brief reign. “The Crimean War caused an exodus of the Crimean Tartars. From the total Tartar population of 300,000 in the Tauride Province, about 200,000 Crimean Tartars moved to the Ottoman Empire in continuing waves of emigration…Since the 19th century, the exodus to present-day Turkey by the large portion of Muslim peoples from the Balkans, Caucasus, Crimea and Crete, had great influence in molding the country’s fundamental features…By the time the Turkish [Ottoman] empire came to an end in 1922, half of the urban population of Turkey was descended from Muslim refugees from Russia. Crimean Tartar refugees in the late 19th century played an especially notable role in seeking to modernize Turkish education.” [Quotes taken from “Ottoman Empire” at http://en.wikipedia.org/wiki/Ottoman_Empire] Do you remember who the Tartars were, descendants of Tur, also a Turkic people in the Steppes of Siberia. Now they have been driven back into what is today Turkey, just another clan of Tur. “In the time of Nebuchadnezzar II the Edomites helped plunder and slaughter the Jews. For this reason the Prophets denounced Edom violently. Although the Idumaeans controlled the lands to the east and south of the Dead Sea, their peoples were held in contempt by the Israelites [from Saul up to the time of the Fall of Jerusalem under Nebuchadnezzar II, 1 Sam. 14:47; 1 Kings 11:14-22; 2 Chron. 20:1-23; 2 Kings 8:21, 2 Chron. 28:17] Hence the Book of Psalms says “Moab is my washpot: over Edom I cast out my shoe.” According to the Torah, the congregation could not receive descendents of a marriage between an Israelite and an Edomite until the fourth generation…During the revolt of the Maccabees against the Seleucid kingdom (early 2nd century BC), II Maccabees refers to a Seleucid general named Gorgias as “Governor of Idumaea”; whether he was a Greek or a Hellenized Edomite is unknown. Some scholars maintain that the reference to Idumaea in that passage is an error altogether. Judas Maccabeus conquered their territory for a time in around 163BC. They were again subdued by John Hyrcanus (c. 125BC) [see http://en.wikipedia.org/wiki/John_Hyrcanus], who forcibly converted them to Judaism and incorporated them into the Jewish nation, despite the opposition of the Pharisees. Antipater the Idumaean, the progenitor of the Herodian Dynasty that ruled Judea after the Roman conquest, was of Edomite origin. Under Herod the Great Idumaea was ruled for him by a series of governors, among whom were his brother Joseph ben Antipater and his brother-in-law Costobarus. Immediately before the siege of Jerusalem by Titus, 20,000 Idumaeans, under the leadership of John, Simeon, Phinehas, and Jacob, appeared before Jerusalem to fight on behalf of the Zealots who were besieged in the Temple…After the Jewish Wars the Idumaean people are no longer mentioned in history, though the geographical region of “Idumaea” is still referred to at the time of Jerome.” [taken from http://en.wikipedia.org/wiki/Edom] So that is the branch of Edom that did not migrate out of Palestine very early on, into Persia and beyond. The Romans probably ended this line of Edom with the slaughter of the Jews, and what remained were scattered just as the Jews were. Notice one thing. 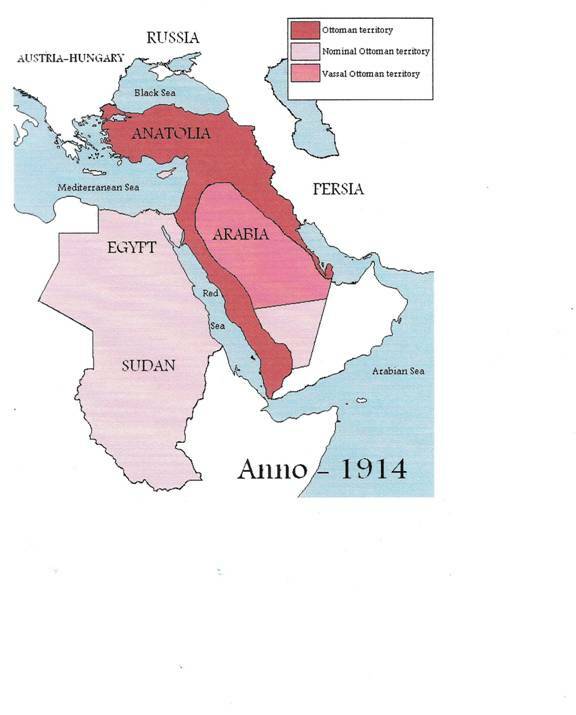 The Ottoman Turks’ control of the Middle East and Palestine was never lost from 1512 to 1917. Previously the Seljuq Turks has held the Middle East and Palestine from 1071 to 1300. But Ottoman armies would have had to pass through Palestine, even perhaps being garrisoned there on their journeys to the Eastern frontier of their Empire, on their way to the “Eastern Front” battling Persia, Egypt and Baghdad periodically. A Turkish military army-navy presence was always in the Middle East and Palestine as a direct result. As you can see, the Ottomans wielded very large armies and navies of Turkish soldiers and sailors. Intermarriage and interbreeding of Turkic peoples as a result of occupation forces living in the Middle East and the area of Palestine occurred over a very long period of time, from the Seljuq’s in the 10th century, through Ottoman occupation going from the 1300s all the way through to 1917 when the British defeated Ottoman rule in Palestine at the hands of General Allenby in the West Bank. My prognosis, based on historic fact of military presence of Turkish military personnel, and Turkish landowners in Palestine, that there is a good mixture of the Turkic race within all those who call themselves Palestinians. All things considered, there must be a strong ethnic presence of Edom, Esau within the Palestinians living in Gaza, the West Bank and the Israeli nation itself. And “Esau” wants his birthright back, and he’s willing to take it back by force, when Biblically God, Yahweh gave it to Jacob and his sons, who became the 12 tribes of Israel. Now let’s see what the United Nations is about to do in September of 2011, which if they succeed could lead to major strife and war between the Israelis and Palestinians. 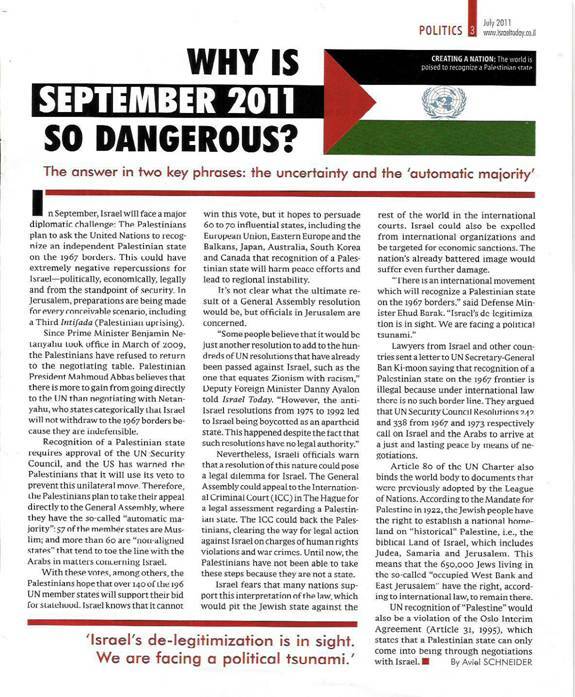 The next page is copied from the magazine Israel Today. That explains who Edom is, and that a good portion of Edom, Esau is probably mixed into those who call themselves Palestinians. Right after the Israel Today article, we will go right into the text of Obediah verses 1-21. Verses 1-8, “The vision of Obediah. Thus says the Lord GOD concerning Edom (We have heard a report from the LORD, and a messenger has been sent among the nations, saying, ‘Arise, and let us rise up against her for battle’): ‘Behold, I will make you small among the nations; you shall be greatly despised. The pride of your heart has deceived you, you who dwell in the clefts of the rock [Petra], whose habitation is high; you who say in your heart, Who will bring me down to the ground? Though you ascend as high as the eagle, and though you set your nest among the stars, from there I will bring you down,’ says the LORD. ‘If thieves come to you, would they not have left some gleanings? Oh, how Esau shall be searched out! How his hidden treasures shall be sought after! All the men in your confederacy shall force you to the border; the men at peace with you shall deceive you and prevail against you. Those who eat your bread shall lay a trap for you. No one is aware of it.’ [verse 7, This points to an end-time confederacy, but their allies will end up turning on them.] ‘Will I not in that day,’ says the LORD, ‘even destroy the wise men from Edom, and understanding from the mountains of Esau? Then your mighty men, O Teman, shall be dismayed. To the end that everyone from the mountains of Esau may be cut off by slaughter.’” Verse 9, ‘O Teman’, some take this as a hidden reference to Ottoman, the Turkic Ottoman Empire which occupied the Promised Land in the Middle East for 400 years. We’ve already seen the historic link which connects the Palestinians to the Turkic race, and all the historic connections linking the Turkic race to Edom and Esau. The LORD just threw a little identifier-teaser into Obadiah’s prophecy in verse 9 here. In verse 7, this confederacy is more than likely none other than what Daniel refers to as “the king of the south” in Daniel chapter 11, verse 40. This could very well be a confederacy of Arab states, which have linked themselves together in some form of Caliphate. Right now as I write this, Muslim Brotherhood inspired and orchestrated demonstrations have brought down the Egyptian government of Hosni Mubarak, the government of Tunis, and Col. Qaddafi’s Libyan government. Basher Assad’s Syrian government has been putting down peaceful demonstrations with brutal military force, 3,000 dead civilian Syrians so far, and these demonstrations be carried out by peaceful unarmed Syrians acting under the hidden coordination of the Muslim Brotherhood. If Syria’s government falls, and perhaps Algeria’s too, for a short time you will have democratic nations within a swath of Arabic nations stretching across North Africa, past Israel, and through Syria. But voting will be heavily influenced by the Muslim Brotherhood, as is happening in Egypt, and they will all vote in Islamic states under Sharia law, highly anti-Israeli, and anti-Christian. These nations will also form into a type of Caliphate of states which Daniel chapter 11 refers to as the “king of the south.” Other major oil producing Arabic nations could fall under Muslim Brotherhood demonstrations too, such important nations as Saudi Arabia, Bahrain (hosting an important US Naval Base), Yemen, and perhaps even Iraq. As a Caliphate of nations acting as one, they could turn off the oil spigot to the Western world, and particularly Europe. If a Palestinian nation is birthed by the United Nations, it will undoubtedly be allied with such a caliphate of Muslim Brotherhood nations stretching from Tunis to the northern Syrian border, placing the Israeli nation right in the middle of a Muslim Brotherhood sandwich. Turkey itself would be an interesting nation to watch, as they are Edomites as well. But Turkey has close ties to Europe and Germany, so she might not be part of this “confederacy of nations”, but like the Palestinians, allied to it. Verses 10-16, “For violence against your brother Jacob, shame shall cover you, and you shall be cut off forever. In the day that you stood on the other side---in the day that strangers carried captive his forces, when foreigners entered the gates and cast lots for Jerusalem---even you were as one of them. But you should not have gazed [gloated over] on the day of your brother in the day of his captivity; nor should you have rejoiced over the children of Judah in the day of their destruction; nor should you have spoken proudly in the day of distress. You should not have entered the gate of my people in the day of their calamity. Indeed, you should not have gazed [gloated over] on their affliction in the day of their calamity, nor laid hands on their substance in the day of their calamity. You should not have stood in the crossroads to cut off those among them who escaped; nor should you have delivered up those among them who remained in the day of distress. For the day of the LORD upon all nations is near; as you have done, it shall be done to you; your reprisal shall return upon your own head. For as you drank on my holy mountain, so shall all the nations drink, and swallow, and they shall be as though they had never been.” Apparently, end-time Edom cuts off the escape of Israelites, turning them over to their enemies. Verse 15 identifies this as the end-times, occurring during “the Day of the LORD.” The setting is Jerusalem and wherever Israelites are trying to escape from, during the “Day of the LORD.” At the end of World War III, surviving captives from the nations which make up the ten-tribes of Israel, held for nearly three and a half years in slave-labour camps within Europe, will be trying to make their way to the land of Israel. As they cross over into Turkey, this prophecy indicates that they will be turned back and handed back over to the European superpower state which the Bible calls the Beast. God will judge Edom severely for this, as indicated in this prophecy. Verses 17-21, “‘But on Mount Zion there shall be deliverance, and there shall be holiness; the house of Jacob shall possess their possessions. The house of Jacob shall be a fire, and the house of Joseph [the house of Joseph specifically refers to the head tribes of Ephraim and Manasseh, and the house of Jacob refers to all 12 tribes of Israel, not just Judah] a flame; but the house of Esau shall be stubble; they shall kindle them and devour them. And no survivor shall remain of the house of Esau,’ for the LORD has spoken. 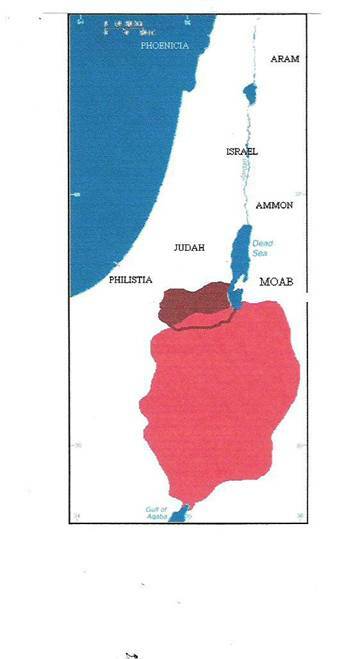 The South shall possess the mountains of Esau, and the Lowland shall possess Philistia [Gaza, and that region]. They shall possess the fields of Ephraim and the fields of Samaria. Benjamin shall possess Gilead, and the captives of this host of the children of Israel shall possess the land of the Canaanites as far as Zarephath. The captives of Jerusalem who are in Sepharad shall possess the cities of the South. Then saviors shall come to Mount Zion [that’s us, folks!] to judge the mountains of Esau, and the kingdom shall be the LORD’s.” Here in this set of Scriptures we can see all the tribes of Israel being covered here. The word “saviors” can also be translated “deliverers” and is a direct reference to the resurrected immortal saints coming back with Jesus Christ as he descends on the Mount of Olives (cf. Zechariah 14:1-15). Evidently, no male Edomite will survive on into the Millennial Kingdom of God, which ultimately will encompass the whole world. But they will all have their chance for salvation when they come up in the 2nd resurrection, along with all the rest of the “unsaved dead.” Refer to the commentary of the Book of Ezekiel, Ezekiel 37:1-14. Sepharad refers to the Jews who from the early medieval times lived in Spain and were referring to themselves as Sephardic Jews. During the Inquisition in Spain many hid their Jewish identities and switched over to Roman Catholicism to escape the Spanish Inquisition. Many are starting to uncover their Jewish lineage, and have now also become known as Sephardic Jews. It is probably these Jews will come under captivity during WWIII, as they dwell in Spain, a European nation which is highly Roman Catholic, and most definitely will be part of the Beast Empire. So God through Obadiah is prophecying that these Sephardic Jews will be released and return and possess the land of the Negev. Many Sephardic Jews have discovered their lineage who live in the various nations in South America. All those who survive will be regathered by Yeshua, brought back to the Promised Land, where they will take up residence in the Negev, which by then will blossom like a rose and no longer be a desert. A Messianic Jewish ministry headquartered in Israel has been reaching out to these Sephardic Jews in South America and Spain for some years now, and some of them have already accepted Yeshua haMeshiach as their Messiah. Shortly after the resurrection to immortality and the return of Yeshua haMeshiach to earth, they will be able to go out and find their Sephardic brethren and orchestrate their return to the Promised Land. How exciting, that God has already been laying the foundation for their return to Israel! Psalm 37, a Psalm of David where David talked about the wicked, and how we are not to fret about them, even though it seems like they are prospering now, he says in verses 35-38, “I have seen the wicked in great power, and spreading himself like a native green tree. Yet he passed away, and behold, he was no more; indeed I sought him, but he could not be found. Mark the blameless man, and observe the upright; the future of the wicked shall be cut off.” That is the future of Edom, as compared to Israel. But they will have their chance for salvation in the 2nd Resurrection.